Communion wafers don’t taste good. They don’t taste like much of anything, in fact, so why is it that the paper-thin hosts, as the Church calls them, are so damn satisfying to munch on? The Takeout has already explored the mass appeal of communion wafers, tracing 80 percent of the wafers used in U.S. churches to just one family-run host-baking company out of Rhode Island. But today we learned of a new twist: Some churches are offering gluten-free versions. The Vatican’s reasoning seems to be that the Eucharist should as closely as possible replicate the bread and wine Jesus served his disciples at The Last Supper; Protestant congregations tend to view Communion in a more symbolic manner, which seems to afford them more leeway on the gluten question. 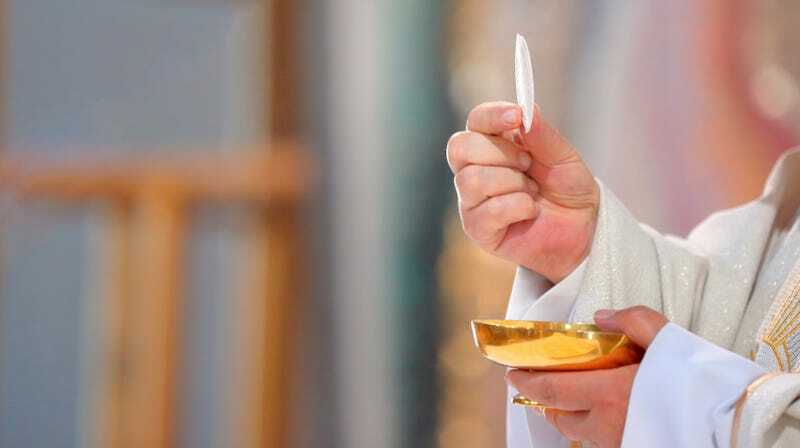 According to an article from Catholic News Agency, a Nebraska priest with celiac disease received special permission from his diocese to use gluten-reduced hosts in the celebration of Mass; his parish purchases them from the Benedictine Sisters of Perpetual Adoration in Clyde, Missouri. (A 30-pack of low-gluten hosts costs $5.50; a 500-count box of the standard white hosts costs $9.03). I could go on! The issue of gluten in Communion wafers is fascinating to this Catholic school graduate, who despite a decade of theology classes never heard this detail discussed. Or maybe it was, and I was too busy sneaking unconsecrated hosts from the altar servers’ supply closet.